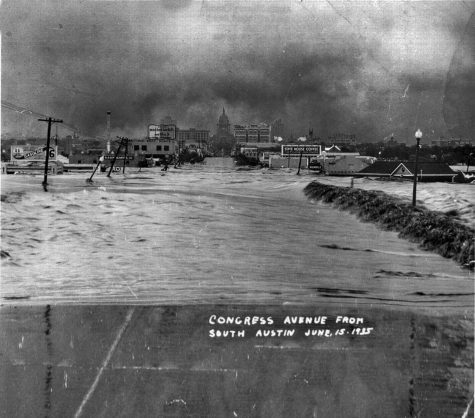 Congress Avenue and the Capital in the 1935 flood in Austin. An article from the Associated Press (AP) by Bajak and Borenstein on May 18 tells us that: “Extreme downpours have doubled in frequency over the past three decades.” This is a tall statement with serious implications. The alarming nature of this statement is the reason that the Climate Change Now Initiative exists (of which I am the director). The initiative researches these type of statements and reports on their basis because if true, it is imperative that the public understand why these statements are true so that we can help influence climate policy to help do something about it. Nielsen-Gammon’s response to my query was that he had done the calculations and he forwarded me his spreadsheet. It’s not published, but it looks pretty robust and it is controlled for the number of stations (an important statistical thing), and he does have a PhD in meteorology. The story now goes to Neilsen-Gammon’s work. Nielsen Gammon’s evaluation looked at the entire period of rainfall records in Harris County beginning in 1889. Harris County is now completely engulfed in the Houston megaplex. Until the 1920s there was only one weather station in the county. Until WWII only 2 stations, then they proliferated to 17 stations total. Nielsen-Gammon’s work compared the last 30 years to the entire record, but the robust part is contained in the last 60 years since the number of weather stations proliferated after WWII. His evaluation indicates a doubling of rainfall in excess of 8 inches in two days since 1986, compared to the previous 30 years. Specifically, this is the 10-year 2-day storm in Houston measuring 8 inches. The ten-year storm is commonly thought of as occurring on average every ten years and more technically a one in ten chance of happening in any given year. (In Austin this storm is 6.5 inches.) And indeed, in Houston this storm is happening twice as often over the last 30 years as it did in the previous part of the record. It is important to understand that Nielsen-Gammon’s evaluation reported the “average” over the last 30 years. If these extreme storms have only begun to become more frequent in the last ten years plus or minus, like what appears to be happening in many other places across the world in other published science, this average understates reality because it is a 30 year average. Very specifically, in 2007, 2013, 2015 and 2016 these storms that have actually occurred in Houston are about triple the number of 8-inch plus storms from the 30 years previous to 1986. So the true number of storms since about 2007 (in Houston) in this extreme category is likely significantly greater than “double” the past. Another really important thing to understand about these changes is a quote by the executive director of the Harris County Flood Control District. The AP authors tell us that new development has caused a lot of the flooding and this is a very common theme not only in Houston, but everywhere there is “new development.” This concept however, is almost completely wrong; almost. But developers don’t build enough floodwater retention into their projects, and “areas that never flooded before now flood in the smallest event,” said Ed Browne, chairmen of the citizens’ group Residents Against Flooding. For example, if a property previously had construction and is being redeveloped, building codes don’t require detention ponds. “That’s just not how the laws are set up,” said Mike Talbott, executive director of the Harris County Flood Control District. He said blaming new construction for worsening flooding is unwarranted. “The new growth is mitigating its own impacts,” he said. In Houston and Harris County, just like in Austin and Travis County (and Williamson County and etc. ), only a very small percentage of new development is capable of increasing flooding. This is because all new development AND redevelopment is required to have flood detention–has been since the 1980s. We hear that increased development is causing the flooding in the news every time it floods. The reality is, and this comes from an engineer who has been a hydrologist for over thirty years as well as the executive director of the Harris County Flood Control District, only a very small part of increased flooding comes from increased development since the 1980s. Bajak and Borenstein, Climate Change, Runaway Development Worsen Houston Floods, Associated Press, May 18, 2016.